UBTECH Robotics, a global leader in intelligent humanoid robotics and AI technologies, today announced JIMU Robot Mythical Series: UnicornBot Kit, a codable and interactive robot unicorn that brings a new sense of magic and wonder to creating with robots. Designed to delight girls and boys age 8 and up, UnicornBot was inspired by the belief that all kids, regardless of gender or interest, should feel welcome in robotics. Jobs in STEM are expected to grow more than 10% by 20271, yet research shows girls' interest in STEM activities plunges by age 15. One reason experts cite is a common perception that STEM activities don't align with many girls' interests or creativity2. UnicornBot aims to prove that through magical design and powerful features, robots and STEM toys can capture girls' imaginations, too. "Kids gravitate to STEM toys because technology makes learning feel fun and empowering without being forced," said John Rhee, senior vice president and general manager, North America, UBTECH. "Likewise, kids are drawn to unicorns for their sense of enchantment and power. By introducing UnicornBot as the first JIMU Robot in our new Mythical Series, we want to expand the audience for STEM toys by tapping into one of the most popular themes on the toy market today, while shattering preconceptions of what a STEM toy is and who should benefit from early exposure to STEM concepts." 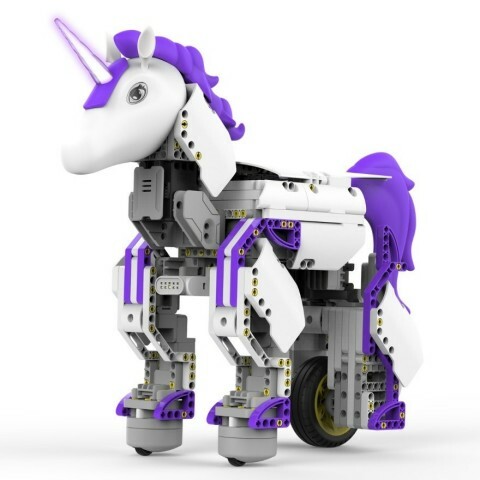 A radiant white unicorn with an eye-catching purple tail and mane topped with a programmable light-up horn, UnicornBot includes new technology that makes this mythical creature a rare blend of style and substance. Use the free JIMU app for iOS or Android devices to build UnicornBot with step-by-step, 360-degree instructions, then control UnicornBot's movements using your smart device. Since unicorns are naturally associated with rainbows and color, UnicornBot is the first JIMU Robot with a built-in color sensor that recognizes up to eight different colors. Use intuitive Blockly coding to program UnicornBot's LED horn to change colors in response to what it senses, or incorporate the two smooth-motion robotic servo motors and powerfu DC motor for combined movements, such as lowering its neck to "drink" when it senses blue for water. The possibilities for creative play are endless. The JIMU Robot Mythical Series: UnicornBot Kit retails for $119.99 and is available for purchase beginning today at leading retailers including Target, Sam's Club, Apple Stores, Amazon.com (News - Alert), and jimurobots.com. For more information on UBTECH and its complete line of robots, please visit ubtrobot.com. Established to provide cutting-edge technical solutions, UBTECH Robotics is a highly innovative software house, systems integrator and technology provider. The company is best known globally as the industry leader in humanoid robotics, such as Stormtrooper, Alpha 1S, Lynx and Cruzr, as well as its award-winning JIMU Robot line of robots designed to support STEM education in a fun, hands-on way. With its world-class robots that are interactive and enjoyable for the entire family, UBTECH Robotics allows you step away from traditional play and into a world where robots are our friends. For additional information about the company, follow UBTECH Robotics on Facebook, Instagram, YouTube and at www.ubtrobot.com. © 2018 UBTECH Robotics, Inc. All rights reserved. UBTECH Robotics, the UBTECH logo, and JIMU Robot are trademarks of UBTECH Robotics, Inc. All other names of companies and products mentioned herein may be the trademarks of their respective owners. 3 Please see the JIMU app for minimum hardware requirements for augmented reality.